While the largest section of concrete and terracotta roofing consists of field tiles that are easily secured to the roof, special adhesive is needed for hip and ridge tiles. One of the best adhesive mechanical fasteners for popular concrete and terracotta Boral roof tiles is Flexible Pointing, as it meets and exceeds building code standards for fixing hip and ridge tiles to roofs. The roof’s ridge is the horizontal line where the planes of the roof meet at the peak. The hip is the area of slope line between two roof planes that meet at an angle. 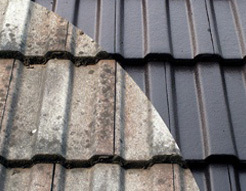 Most often, the hip and ridge roof tiles are exactly the same, unless the roof’s pitch varies in certain areas. Regardless of size, hip and ridge roof tiles are open at the ends, except for starter tiles which have an angled closed end typically forming a point. During installation of Boral roof tiles, open ended hip roof tiles mount over the closed starter hip tiles covering the peek and slope lines of your roof. 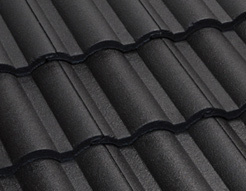 Hip and ridge roof tiles have pre-drilled holes that allow them to be anchored to your roof using either nails or screws that fasten into a wooden nailer or support stringer. Flexible Pointing adhesive is used to seal the area where each tile overlaps. Flexible Pointing is also used as a weather block between cut field tile roofing and the stringer for the hip, it prevents wind and driven rain from reaching behind roofing tiles. Unlike traditional cement mortar pointing that can crack or break, Flexible Pointing is the preferred adhesive because it retains a post cure flexibilty that allows it to ‘flex’ with the roof movements without breaking or cracking. Made in Australia, Flexible Pointing tile roofing adhesive is ideal for new roofs and roof repair work. It comes with a 10 year product warranty and is available in range of heritage colours that match Boral concrete and terracotta roof tiles. If you are a builder or contractor, it should be your proffered fastener for ridge and hip tiles. 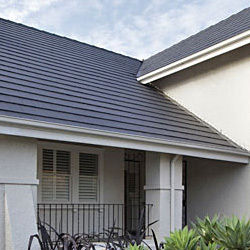 For property owner, you can find Boral hip and ridge tiles that are specially designed to match the exact pitch of your roof at Ajax Gregson Tiles. These come in standard or decorative profiles, with a wide selection of colours to choose from. For more information about Flexible Pointing tile roofing adhesive, and our quality Boral concrete and terracotta rood tiles, you can contact us here at Ajax Gregson Tiles.